Just 90 minutes from the hustle and bustle of Dallas, this spectacular country getaway on 210 pine-studded acres is a true sportsmans paradise the whole family will enjoy. The sparkling, spring-fed Lake Athens is home to some of the best boating, skiing and championship bass fishing in all of Texas. Inside, the homes clean lines and fabulous woodwork create a luxurious yet comfortable mix thats perfect for country living. Floor-to-ceiling windows bring in filtered light from all sides, and light walls beautifully contrast with the dark hardwood floors. The private library offers French doors, custom built-ins and a cozy fireplace making it the perfect retreat for reading and relaxation. The gourmet kitchen is light and bright with Carrara marble counters, white wood cabinetry and high-end stainless Viking appliances. Here youll enjoy fabulous lake vistas from the wall of French doors on two sides leading to the wraparound porch. A large breakfast area and separate lounge seating area with fireplace anchors one side, while the open family room sits opposite. Upstairs, there are five lovely ensuite bedrooms all with veranda access and gorgeous lake or meadow vistas. The master retreat includes a large private sitting room with sisal carpet, fireplace, integrated sound system and birds eye views to the pool below. In addition to the infinity-edge pool and spa, theres also a lighted tennis/basketball court and a separate grass sports field thats perfect for football, soccer or lacrosse. And thats just the start of the recreation! With 1,500 feet of shoreline, youll also enjoy incredible amenities right on the water, including a three bay boathouse with boat and jet ski lifts, plus a large covered deck and separate floating bunkhouse that kids of all ages will love. Nearby, an outdoor living and entertainment pavilion features a massive stone fireplace, vaulted ceilings and grill/kitchen area with everything you need to serve up a Texas-sized feast for family and friends. And thats important after a long day on the lake or a trail ride on horseback around the stables, pastures and barn. After sunset, guests can gather round the fire pit before bedding down at the main home, the bunkhouse, carriage house apartment or a separate guest house also on the estate. No matter where you lay your head, the sounds of crickets and wildlife will lull you to sleep, with dreams of yet another day in this private paradise. If youre looking for a truly special place to create new and unforgettable memories, Camp Menehune is just place for you and your family. 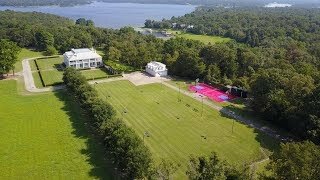 Come visit this East Texas jewel and experience all the beauty, serenity and magic of this magnificent lakefront estate.